A Tunisian family including several authors. Talmudist; lived at Tunis in the second half of the eighteenth century. He was a pupil of Isaac Lombroso and Ẓemaḥ Ẓarfati. He wrote several works, only one of which, a commentary on several treatises of the Babylonian Talmud, has survived. It was published by his great-grandson Zion Ghez, under the title "Ner Dawid" (Leghorn, 1868). Son of the preceding; died at Tunis after 1850. 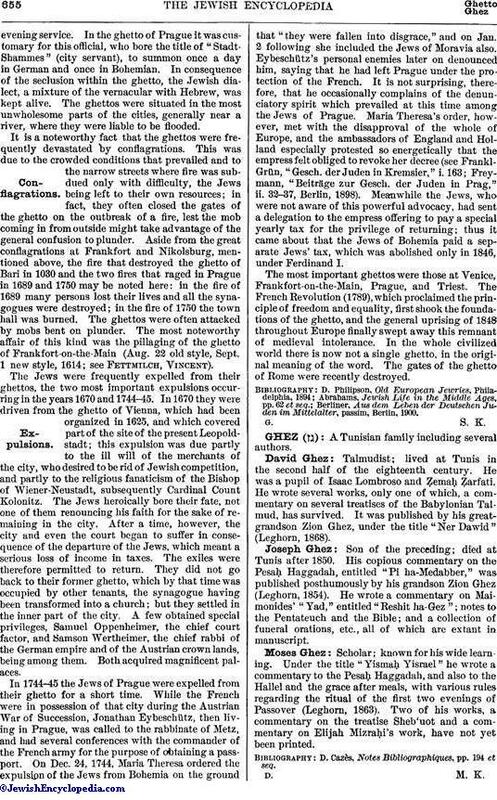 His copious commentary on the Pesaḥ Haggadah, entitled "Pi ha-Medabber," was published posthumously by his grandson Zion Ghez (Leghorn, 1854). He wrote a commentary on Maimonides' "Yad," entitled "Reshit ha-Gez"; notes to the Pentateuch and the Bible; and a collection of funeral orations, etc., all of which are extant in manuscript. Scholar; known for his wide learning. Under the title "Yismaḥ Yisrael" he wrote a commentary to the Pesaḥ Haggadah, and also to the Hallel and the grace after meals, with various rules regarding the ritual of the first two evenings of Passover (Leghorn, 1863). Two of his works, a commentary on the treatise Sheb'uot and a commentary on Elijah Mizraḥi's work, have not yet been printed. D. Cazès, Notes Bibliographiques, pp. 194 et seq.